What Does "Mailbox Unavailable" Mean and How Do I Fix It? - Ask Leo! 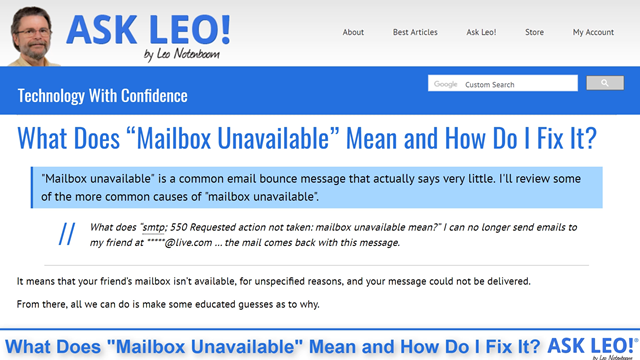 "Mailbox unavailable" is a common email bounce message that actually says very little. I'll review some of the more common causes of "mailbox unavailable". What does “smtp; 550 Requested action not taken: mailbox unavailable mean?” I can no longer send emails to my friend at *****@live.com … the mail comes back with this message. It means that your friend’s mailbox isn’t available, for unspecified reasons, and your message could not be delivered. From there, all we can do is make some educated guesses as to why. “Mailbox unavailable” is a frustratingly vague message. The only thing it tells you is that the mail could not be delivered, without giving you any clue as to why. Unless there’s additional text in the error message saying more — which there typically isn’t — there’s simply no way to know exactly why it failed. Different mail systems use different error texts to report the same errors. So whatever might cause a “mailbox unavailable” from one system might generate a completely different message from another. So, all we can do is make some educated guesses. I can’t say which of these might be the cause in your situation, or even if I’ve listed all the reasons you might get this the error message below, but these are the most common possibilities. First things first: make absolutely certain you’ve entered the email address correctly. Any error could have you sending to a non-existent account, which could easily result in this error. This is perhaps the most common cause of “mailbox unavailable”. This is a variation of the preceding item: it’s possible that the email address you’re sending to may have been valid at one time, but has been closed since then. Make sure you’re not only entering the address correctly, but that it’s the correct email address for whomever you’re attempting to reach. It’s possible the account was suspended due to abuse. This might mean your recipient was doing something they shouldn’t have, but more often it means the account was hacked and taken over by someone using it to send spam. The account could remain suspended indefinitely, or things could return to normal once your recipient regains access to it. If your message looks like spam to the recipient’s email server, “mailbox unavailable” is one way servers reject your message. They intentionally don’t say “this is spam” to avoid giving spammers any clue about how to bypass the filters. Try rewording anything that might be misinterpreted as spammy. A surprisingly common scenario is that the recipient’s email server is actually having a problem of some sort and can’t deliver the email. When this is the case, typically the problem is resolved in a matter of a few hours or so. Wait awhile and try again. Most email services have limits (or “quotas”) on how much email they’ll accept and store. Your recipient may have exceeded this limit. Most email services will include something about a quota or limit being exceeded in the bounce message, but they could also just say that the mailbox is unavailable. While those are all things to look at and try to rule out, what it all boils down to is that any reason for email not being delivered could, in fact, cause this message. When I find myself in this position, I try to contact my correspondent some other way. Does Bounced Email Mean All the Recipients Didn’t Get My Message? - When an email message comes back to you because of a problem, exactly who did or did not get the message depends on the error and where it happened. Can I Count on Mail to a Bad Address Bouncing Back? - If you send email to an invalid address or a closed account, usually you'll get a bounce back. Usually. But you cannot count on bounces. one more possibilty: your friend hasn’t checked their email in 30 days or in some cases 90 therefore causing it to be suspended or closed to to inactivity. If this is the case it can sometimes be reactivated. Leo, I hope you can set me straight. 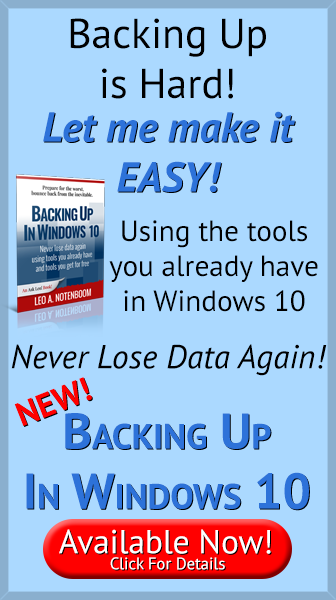 I have been a MSN Explorer member for a few years now. All of a sudden a couple of months ago I am unable to get on my usual e-Mail program. I have tryied to ask for a CD to get back on line with them with NO avail. WHY????? Please tell me whats going on with MSN and when I can get back to my usual e-mail page. I have already downloaded to Explorer 8 and still I can’t get to my e-mail page. If you can have a CD sent to me?? This is no longer an issue as everybody in the future uses text messaging. On the contrary. It remains an issue, and will for some time. “Everybody” is not using text messaging, nor will “everybody” for a long time to come. Email is in no way dead. That may be true for family and friends. I almost never send email to family and friends, but when it comes to business, I communicate via email or fax and I expect that to continue for years. My statement for a long time has been that younger folks most often start using email as soon as they get a job that relies on it. Email is the communications medium of choice for many jobs, and that’s not going to change for a very long time. Definitely true, but just last week the secretary from the University where I work asked me to send her some scans via Whatsapp. I’m sure that was just a slip of the ̶t̶o̶n̶g̶u̶e̶ fingers as I don’t even have her cell number. I sent her an email and she was happy 🙂 .